Writers On The Move: Is "I Just Like Them" a Good Reason to Use Ampersands? Is "I Just Like Them" a Good Reason to Use Ampersands? I added a new section to the second edition of my The Frugal Editor because ampersands seem to be so popular these days. It’s especially important for editors and those who publish books to both know a little about their history, how to use them, and how Lynn Truss’s of the world might view them. So, I thought I’d share this excerpt today. The ampersand is a real pretty little dude but it isn’t a letter nor even a word. It’s a logogram that represents a word. Its history goes back to classical antiquity, but interesting history and being cute are no reason to overuse it in the interest of trying to separate one’s writing from the pack. Better writers should concentrate on the techniques that make a difference rather than gimmicks that distract. Here are some legitimate uses for the ampersand. 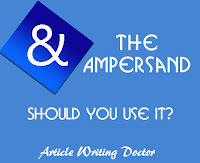 The Writers Guild of America uses the ampersand to indicate a closer collaboration than and, in other words, to indicate a closer partnership rather than a situation in which one writer is brought in to rewrite or fix the work of another. For those in the know it is a convenient way to subtly indicate that one writer has not been brought in to rewrite of fix the work of another. Newspapers, journals and other choose to use it when they are citing sources. That’s their style choice, not a grammar rule. In similar citing, academia asks that the word and be spelled out. Occasionally the term etc. is abbreviated to &c, though I can see no reason for confusing a reader with this. Etc. is already an abbreviation of et cetera and the ampersand version saves but one letter and isn’t commonly recognized. For a little style guide from the point of view of academia go to https://owl.english.purdue.edu/owl/resource/560/03/. To see a graphic artist’s creative use of the ampersand, one based on the authenticity of its simply being visually attractive, and go to the back of multi award-winning The Frugal Editor for a free offer for the readers of that book. It's a gift from Chaz Desimone. Carolyn Howard-Johnson brings her experience as a publicist, journalist, marketer, and retailer to the advice she gives in her HowToDoItFrugally series of books for writers and the many classes she taught for nearly a decade as instructor for UCLA Extension’s world-renown Writers’ Program. All her books for writers are multi award winners including both the first and second editions of The Frugal Book Promoter and her multi award-winning The Frugal Editor won awards from USA Book News, Readers’ Views Literary Award, the marketing award from Next Generation Indie Books and others including the coveted Irwin award. Her next book in the HowToDoItFrugally series for writers will be Getting Great Book Reviews Frugally and Ethically. 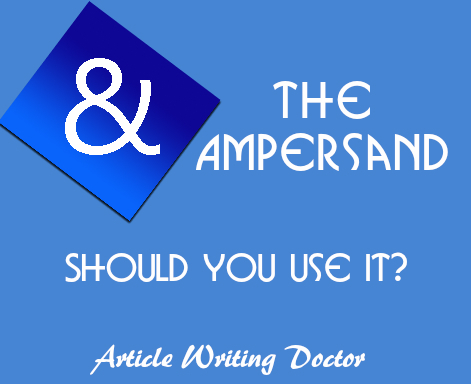 Carolyn, interesting information on the ampersand and how its used in writing. Thanks for sharing!